NEW YORK—August 15, 2018–The Overseas Press Club of America spoke out in support Wednesday for the Foreign Correspondents’ Club of Hong Kong, which has come under pressure from both the Chinese and Hong Kong governments for hosting a pro-independence speaker.The FCC, with whom the OPC maintains reciprocal privileges, resisted pressure from Chinese officials to cancel an event featuring Andy Chan, who advocates independence for Hong Kong from China. The People’s Republic of China re-assumed control of Hong Kong in 1997 from Britain. “At that time, the Chinese promised that Hong Kong could maintain its political system and its liberties for 50 years as part of a plan called ‘One Country, Two Systems’,” past OPC President William J. Holstein said. “Freedom of speech is an incredibly important aspect of what has traditionally made Hong Kong a thriving outpost on China’s doorstep and attracted investments from around the world.” Holstein was based in Hong Kong from 1979 to 1981 and frequented the FCC at its previous location. The FCC’s acting president, Victor Mallet, said China’s Foreign Ministry had made “representations to the club” regarding the event. He did not elaborate. Perhaps more ominously, Leung Chun-ying, who served as Hong Kong’s chief executive from 2012 to 2017, said the government, which owns the building the club rents, should not welcome a tenant that hosts a speaker advocating separatism. Revoking the rental agreement, or demanding an exorbitant increase in rent, could threaten the club’s survival. It is one of the oldest and most prestigious press clubs in the world. “We believe that in free societies such as Hong Kong it is vitally important to allow people to speak and debate freely, even if one does not agree with their particular views,” the FCC said in a statement on Monday. The OPC concurs. Another major press club, the Foreign Correspondents’ Club of Japan, also expressed concern about pressure on the FCC in Hong Kong. 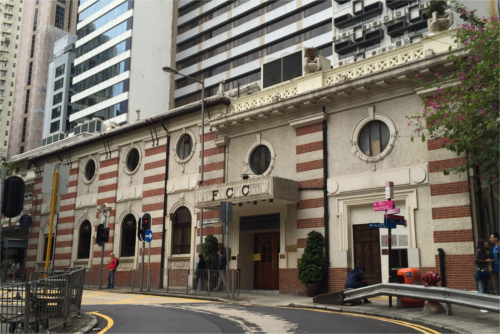 “The Foreign Correspondents’ Club of Japan, its Board of Directors and its Freedom of the Press Committee are alarmed by reports of attempts by current and former Hong Kong government officials and by the Chinese government to pressure the Hong Kong Foreign Correspondent’s Club into limiting debate at FCC events,” the Tokyo-based FCCJ said. “Freedom of expression is guaranteed for decades to come under the term of the (British) handover. We are especially concerned that, beyond persuasion, the government is employing economic pressure, threatening to cancel the FCC’s market-rate lease on the building it occupies. We call upon the governments and former officials involved to cease and desist.” The OPC also maintains reciprocal relations with the FCCJ.